The attack on Sony Pictures has put North Korea’s cyberwarfare program in the spotlight. Like most of the internal workings of the country, not much is known but snippets of information have come out over the years, often through defectors and intelligence leaks. North Korea’s governing structure is split between the Workers’ Party of Korea (WPK) and the National Defense Commission (NDC). North Korea’s main cyberoperations run under the Reconnaissance General Bureau (RGB), which itself falls under the Ministry of People’s Armed Forces that is in turn part of the NDC. The RGB has been operational for years in traditional espionage and clandestine operations and formed two cyberdivisions several years ago called Unit 121 and Office 91. Office 91 is thought to be the headquarters of North Korea’s hacking operation although the bulk of the hackers and hacking and infiltration into networks is done from Unit 121, which operates out of North Korea and has satellite offices overseas, particularly in Chinese cities that are near the North Korean border. One such outpost is reportedly the Chilbosan Hotel in Shenyang, a major city about 150 miles from the border. A third operation, called Lab 110, participates in much the same work. There are also several cyberunits under North Korea’s other arm of government, the Workers’ Party of Korea. The North Korean school system emphasis the importance of mathematics to students from a young age. The most gifted are given access to computers where they can begin practicing programming skills and, if they are good enough, go on to one of a handful of schools that have specialist computer departments. These are typically Kim Il Sung University, the country’s most prestigious seat of learning, Kim Chaek University of Technology or Mirim College. Much less is known about the latter, although it’s believed to be a specialist cyberwarfare school. The students learn general programming techniques and will also specialize in disciplines such as cyberwarfare. After graduating, they will sometimes be sent to study overseas. That’s when, with an open Internet connection and the anonymity of a foreign network, they can start participating in hacker forums, developing malicious software and testing out their skills. 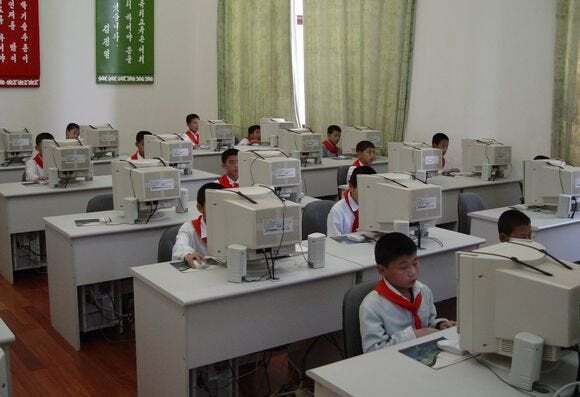 Over the past few years, it’s estimated the schools have turned out several thousand students (estimates range from around 2,000 to around 6,000), who now make up North Korea’s cyberforces. North Korea has a single connection to the Internet, so attacks from inside the country would be quite easy to trace. As a result, the country uses computers around the globe to launch attacks. Often these are compromised PCs and the owners have no idea they’ve been infected with North Korean malware. Some of the initial attacks to help build this network of infected computers are thought to be launched from North Korean outpost offices in places like China, Russia and India. March 2011 - In an attack dubbed “10 Days of Rain,” major South Korean government websites and sites operated by the U.S. military in South Korea are targeted in DDOS attacks. April 2011 - South Korea’s Nonghyup bank is targeted in a DDOS attack that was later traced to North Korea and linked with previous attacks. November 2011 - A hacker attempts to hack the email system of Korea University’s Graduate School of Information Security in an action later blamed on North Korea. March 2013 - A major cyberattack, later blamed on North Korea, paralyzes the networks of several major South Korean TV broadcasters. A bank ATM network is also hit in the attack, which attempted to wipe the hard drives of computers. A second attack pushes the DNS servers of government websites offline for several hours. At around the same time, North Korea’s connection with the global Internet goes down for 36 hours. November 2014 - South Korea’s spy agency said North Korean hackers had planted malware in around 20,000 smartphones.